I decided maybe "Trots" shouldn't be the first thing you see when you get to my blog anymore. So after more than a month (an awesome month of Christmas fun and family), I am back for a quick check-in and update. You may not be surprised to find out that after a New Year's evaluation of my life and everything in it, the blog moved down on the priority list. Running is still pretty close to the top though. So my goal is to take the time to post when I feel like I actually have something to say, not just because I feel like I should post something. We'll see how that goes. To sum up the past month of running and otherwise, I am stealing the Redhead Morgan's monthly recap topics. I decided to leave out my stats since tending to my sick family half the month and losing five days of Arizona running because I was seriously sick myself didn't help rack up the December miles. Current Book: Freedom by Jonathan Franzen. Just picked it up and have only read two pages. I only read 16 books last year. I would really like to double that in 2011. Current Shame-Inducing Guilty Pleasure: Caramel Bugles. I literally ate an entire bag for lunch on Saturday. I am trying to resist the urge to buy more. Current Colors: Pink. With three girls in our house, it's a good thing I love it so much. Current Obsessions: Hot Tamales. We have a candle that makes me crave cinnamon. Current Drink: Water, water, water. I have to admit to loving some Dr. Pepper too though. Current Song: Got the new Ke$ha CD for Christmas. It's growing on me. Current Wish-List: Abs that look as good as they did after five days of sickness-induced near-starvation. Current Need: I NEED to get my Christmas decorations put away ASAP! Current Indulgence: Besides the Caramel Bugles and Hot Tamales? Bread pudding. Yum!! Current Excitement: Skiing lesson #2 for my Princess on Wednesday. Happy New Year! Once I get those darn Christmas decorations put away, I can't wait to catch up on what you all have planned for your upcoming year of running! Caramel bugles. That sounds gross enough that I'm guessing they taste awesome. Gonna have to find some and give them a try. I simultaneously thank you and curse you. I am very scared about these caramel bugles. There are these things only at Target called caramel puffs or something. They are so crazy addicting, we can barely have them around. Now the bugles. And the hot tamales are in my nightstand drawer and I had about a half of a jumbo box last night while watching Sarah Palin's Alaska. I don't know why I watch that show and I don't know why I eat so many hot tamales. Now.....hot tamales.... Yum. Yum. Yum. Love this post. Love this idea!!! How nice that you get to do a race with your hubby! I'm glad you're all feeling better. 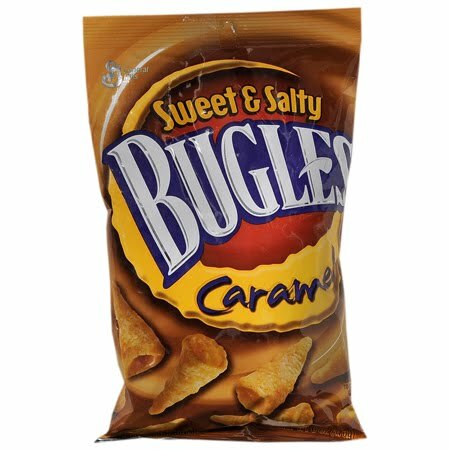 Caramel bugles? Never tried them. However, jalepeno cheetos are my problem.